Former food truck No Bones has a new brick-and-mortar funhouse in Ballard, and part of its proceeds go to animal-rescue shelters. Shortly after 5 p.m. on a recent Saturday, while the rest of barhopping Ballard was still asleep, No Bones Beach Club was rockin’. A couple of gals downed rum shots out of plastic sharks while old-school hip-hop blared overhead. Servers in leopard-print skirts rushed with nacho orders from the faux straw hut to the Tiki bar and back at a dizzying pace. No Bones used to be a vegan food truck. Now it’s a full-on, brick-and-mortar funhouse with a Polynesian kitschy theme and a cause. Part of its proceeds go to animal-rescue shelters. 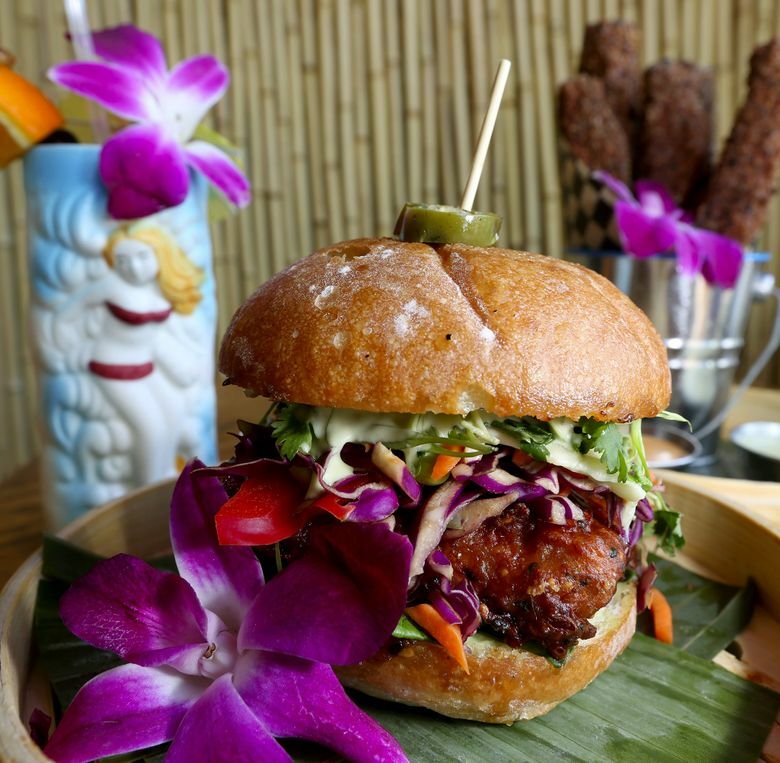 The food is So-Cal-beach-and-Asian inspired: banh mi with scallion tofu dabbed with sriracha aioli and a roll with sesame-crusted taro cake, for instance. Shared plates and bar snacks are a better fit for its convivial atmosphere. Folks all around us had the right idea — munching on nachos coated in a rich cashew and smoked poblano pepper sauce that resembles queso. Or, get the eggplant fries; they taste like Jo Jo potatoes, kicked up with an herbaceous “Sun Goddess” sauce. Both are best washed down with one of the local beers — so local they were brewed less than a mile away. 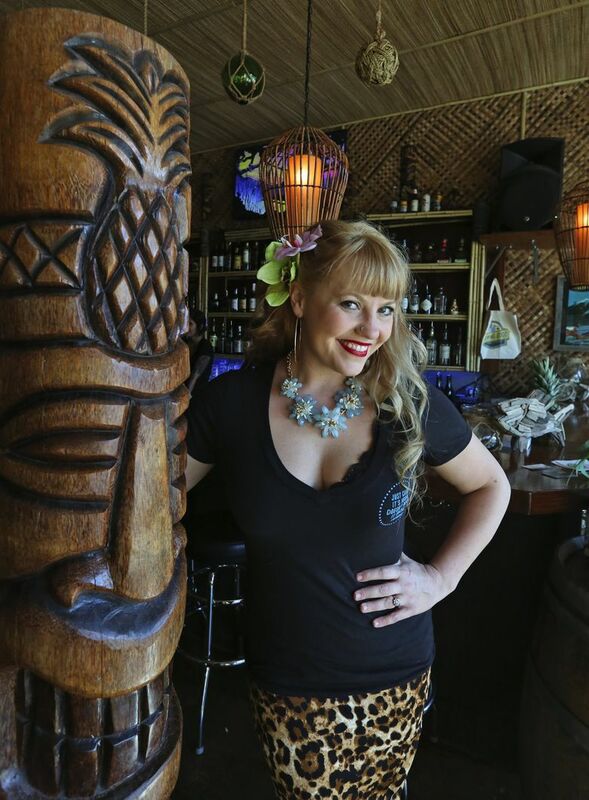 Tiki drinks are all the rage in the craft-cocktail scene. No Bones isn’t that type of a Tiki bar. The cocktails aren’t very good — these cloying, syrupy-sweet concoctions are more like pretty props to go with the thatch-and-bamboo-wainscoting décor, designed to transport your mind to a tropical Nirvana where life is a beach, and there’s always rap to sway to while you chill on a hammock. At brunch, a DJ comes in every Saturday from 11 a.m. to 2 p.m. to spin Top 40 and hip-hop. “We caught flak for the loud music,” DeVito said. No Bones Beach Club, 5410 17th Ave. N.W., Seattle, offers happy hour 4-6 p.m. Tuesday-Friday with $1 off on draft and appetizers; closed on Monday (nobonesbeachclub.com).